The GOLFplay programs are specifically designed to help younger golfers focus on the systems and methods that teach important fundamentals while reinforcing the play aspects of golf - keeping the learning experience fun. GOLFplay is creatively broken into the fundamental aspects of the game working creatively backwards from the hole to the tee. Children learn golf fundamentals and putting motions through imaginative and award winning experiences of art, poetry, and play that are simple, easy, and fun! By starting at the hole, children see success early and are able to focus on the smaller aspects of the game that will make a big difference later on. 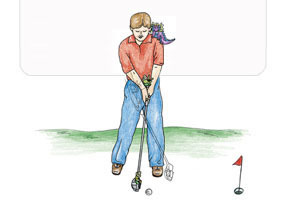 Through more imaginative experiences that are similar to those learned in PUTTINGPlay, children learn the fundamental aspects of golf's short game and focus on fun and exciting ways of getting the ball up on the green and close to the hole. SWINGPlay creatively teaches children the final aspect of golf with interesting and creative challenges that teach them to hit the ball longer and more effectively. Children at this stage are able to put together all of the skills that they have developed to focus on the complete game.